Del Armstrong. Photo courtesy of Columbus Police Department. Columbus police found an unconscious driver behind the wheel of a running vehicle early Saturday morning. 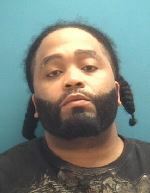 33-year-old Del L. Armstrong of Columbus was found inside the vehicle, stopped in the middle of the intersection of 11th and California streets, at about 4:20 a.m. Saturday morning. Police say that his foot was still on the brake pedal and the car was running, when they tried to wake him. He failed several field sobriety tests and officers got a search warrant to test his blood alcohol level. He is facing a preliminary charge of operating a motor vehicle while intoxicated. This post appeared first on 1010 WCSI.